miss part 1? find it here. 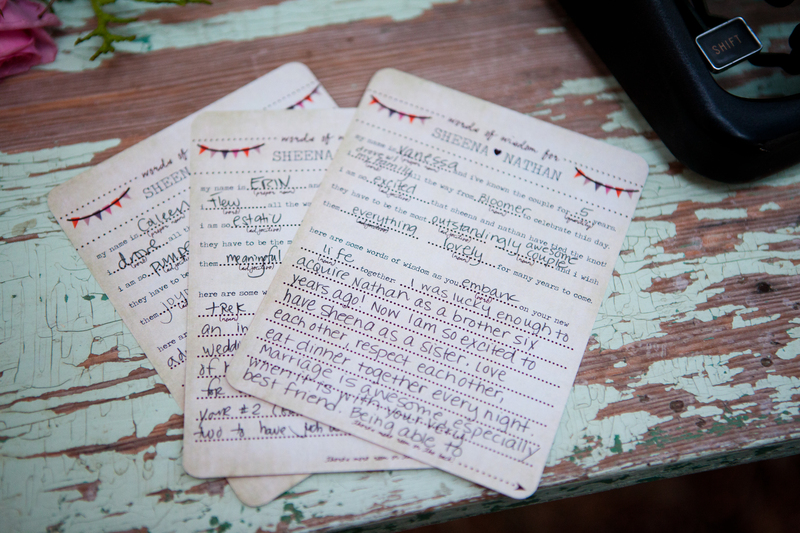 how long did it take you to plan the wedding? we decided to have a surprise wedding the end of january, picked our date (april 28th), and told our parents our plan the first weekend in february. we were busy every weekend and almost every night after work for 3 months. although wedding planning was a blast, we took some time for just us without the planning (where we’d usually just dream about having a house while browsing pinterest. or watch a movie). what was the first thing you planned? what was the first thing you purchased? we planned our wedding schedule around our minister jeremy allard and our photographers jessica sands and krystal muellenberg. after we knew april 28th was a go, we could do the fun stuff… like online shopping. nate has always had a love for bowties. so naturally he had to wear one for our wedding. 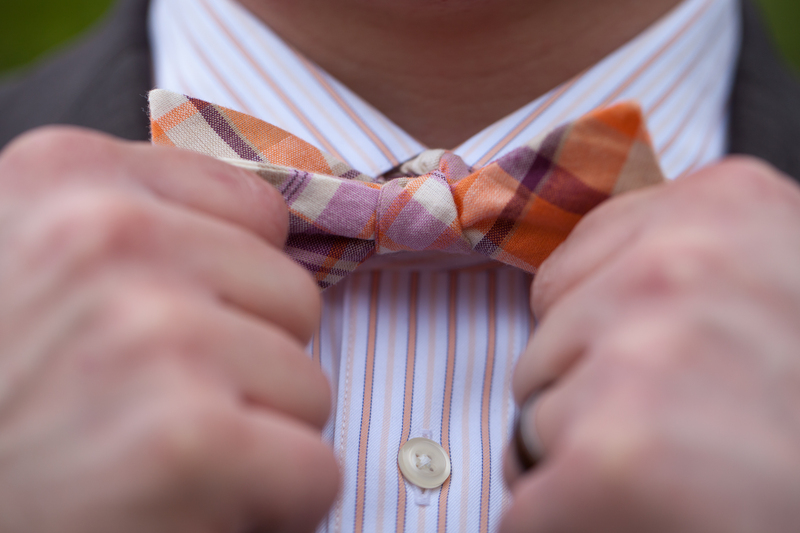 i gave him about 10 options from etsy, and he picked his favorite…orange/pink/burgundy plaid. that served as the inspiration for the color scheme of the wedding. we found a shirt to match from men’s wearhouse (they had buy one-get one, score! ), and a suit from macy’s that would go with the rustic theme. to compliment the wood elements in the wedding (including his ring), i gifted nate with these cufflinks. next, i found my wtoo emerson dress at the wedding shoppe on grand ave in st. paul, mn. i instantly fell in love with this dress. it reminded me of my grandma’s guestroom bed quilt, that i used to lay on as a child. lucky for me, they pulled this new dress off the runway for me to buy off the rack (at a discounted price, no less)! the dress had a great criss-cross pattern, almost plaid like, that really went with the bowtie. 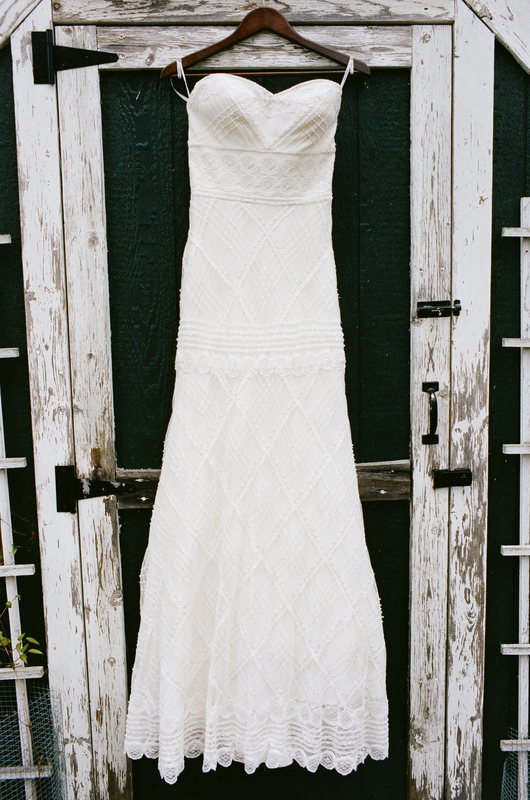 i found a sweater on clearance from anthropologie that matched our color scheme, and was so happy i had it for the reception! my veil and necklace came from che bella. i highly recommend going to this shop. 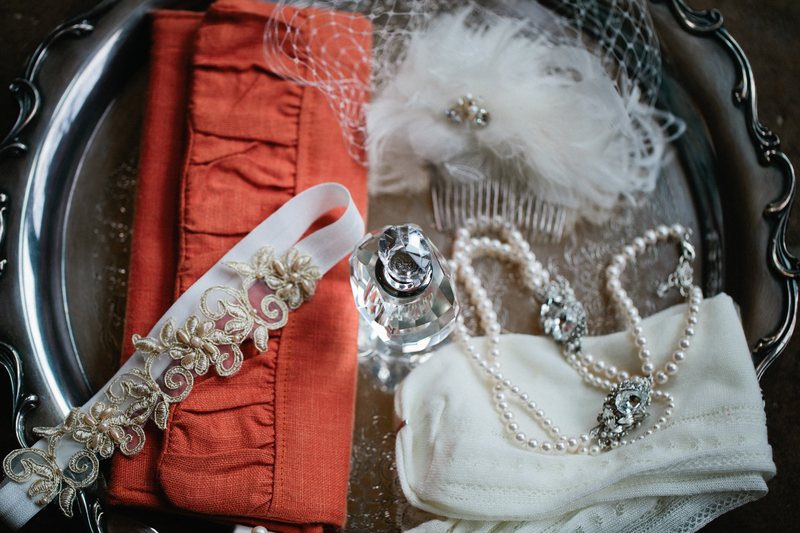 my garter and clutch came from etsy. and my boots were a few years old from nordstroms (socks were $2 from payless shoes!). next we bought a few more things from etsy (these bags to fill with wildflower seeds to be spread after our ceremony; these spoons for our pie filled ramekin favors; these straws for our soda, cocktails, and water; this twine, to be used on almost everything; this cake stand and these forks for nate and my personal dessert. we went to antique/thrift stores and scrounged our parents garages for vintage/rustic details. 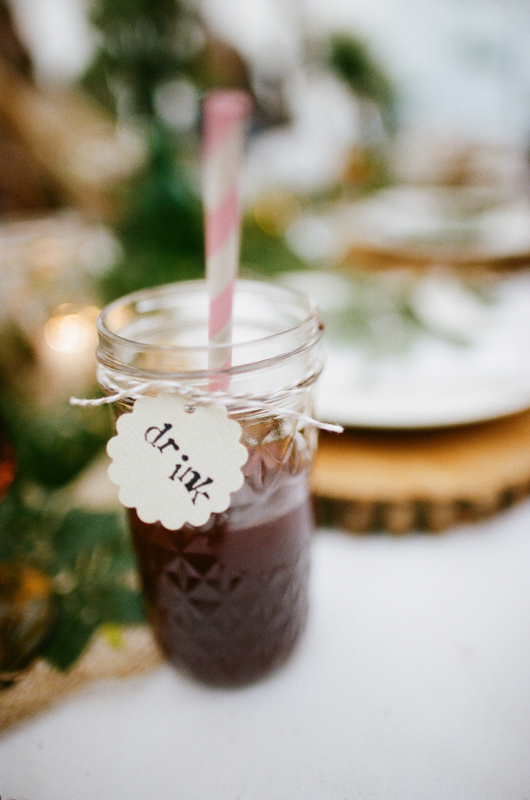 we bought quilted ball jars to house our drinks (because they had the pattern that matched my dress & nate’s bowtie) and found mismatched wine glasses that we sprayed with chalkboard paint. we bought some furniture from craigslist, hope gospel mission, and down to earth to display our desserts/drinks/guest book table. our sweetheart table was a family heirloom, and the quilt we sat on was made by my grandma as a wedding gift (a tradition started by her mother). 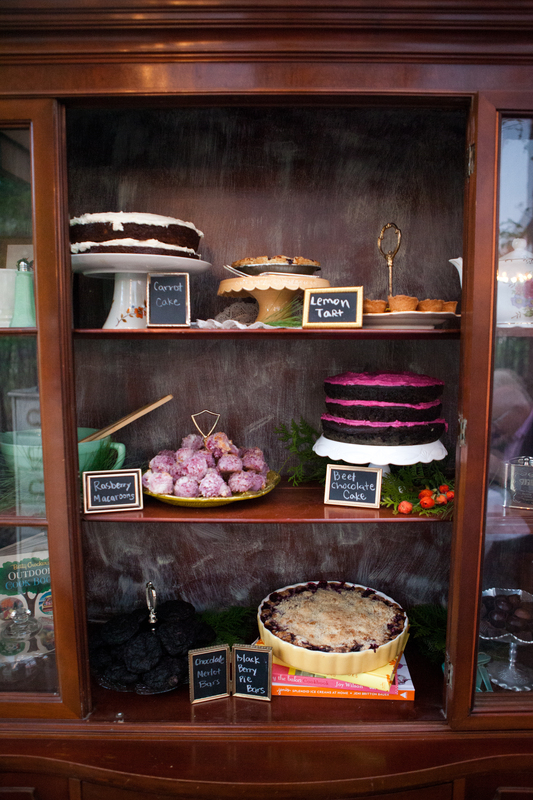 with everything bought or borrowed…we then had to build and cook and bake. 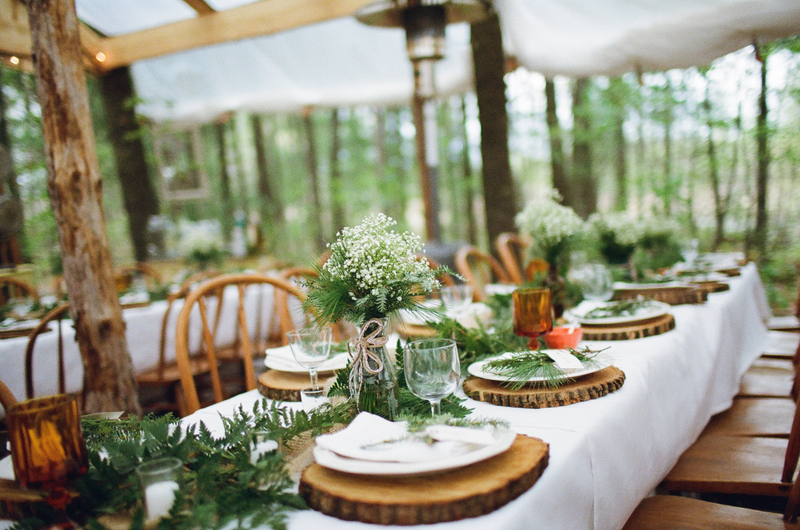 i wanted a reception in the woods. with tables between trees. but our wedding date was april. in wisconsin. we couldn’t do without some sort of shelter. i really did not want a white tent (or folding chairs…unless they were wood folding chairs…). 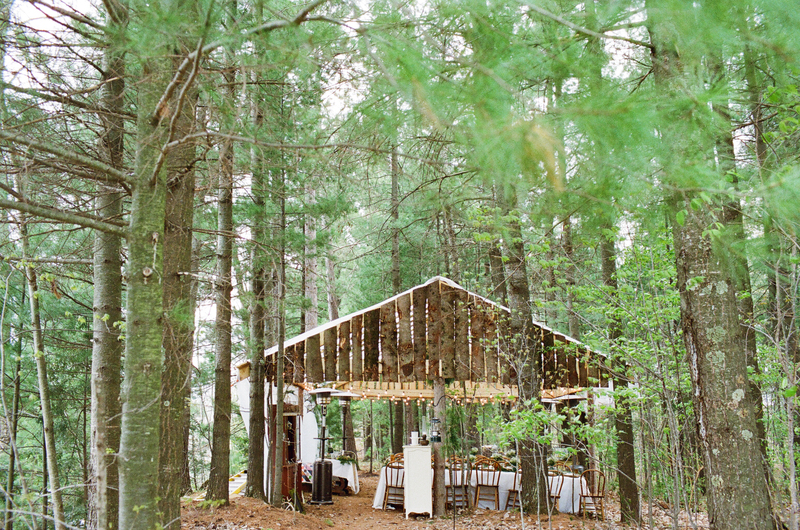 about 6 weeks before our wedding, nate’s parents came up with the idea of a wooden structure, built among the trees. this instantly sounded perfect to us, and we had a great time watching handing tools providing snacks building the structure. i love wood pieces, and really wanted wood chargers. so we spent a day cutting off logs that were 14 inch diameter to accommodate our plates. the days we had in the woods were incredible. we borrowed tables and chairs, and rented linens to cover the tables. i also “built” all of our paper products. 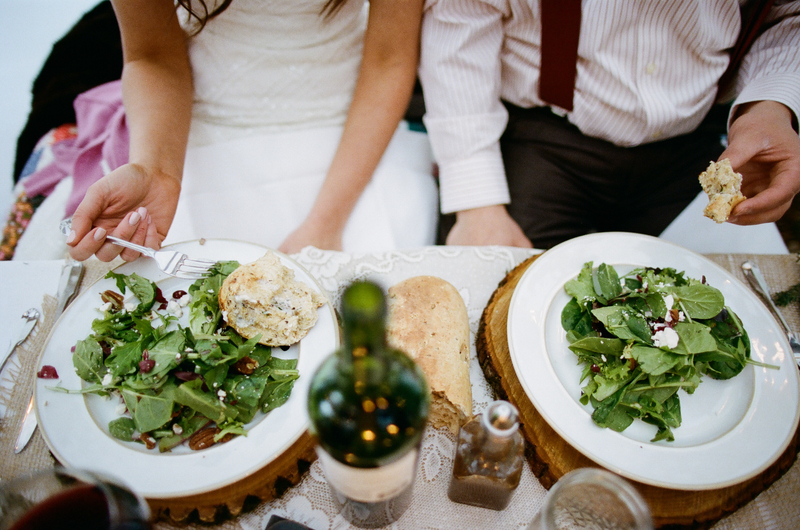 our madlibs, menu, wedding announcements, etc. i loved being able to design the paper products around the colors/theme of our wedding. you made a beet cake? isn’t that gross? yes. not gross at all. try it. we made almost all of our food. we spent about 10 hours making beet ravioli (the meal we had when we fell in love with each other). we bought salad ingredients and made our own vinaigrette. because of time constraints, we bought bread dough from my sister-in-law’s grocery store. it was so delicious, and it warmed my heart seeing people break the bread apart with their hands (because we forgot knives!). we made some herb butter to go along with the bread. we also baked our desserts (including 40 mini pies in ramekins). my mother-in-law, mom and i got together a couple of days and made beet cake, blackberry pie bars, raspberry coconut macaroons, tangerine lemon curd in cookie cups, double dark chocolate merlot cookies, and carrot cake (family recipe). my father-in-law ordered amazing dark chocolate salted caramels as well. who did you hire to help with the wedding? since i didn’t want to spend the morning of my wedding setting up, we hired al miller and richard labelle to do day of wedding set up. i trusted them with my vision, and set out all of the goods for them to put in place. they also did my flowers. 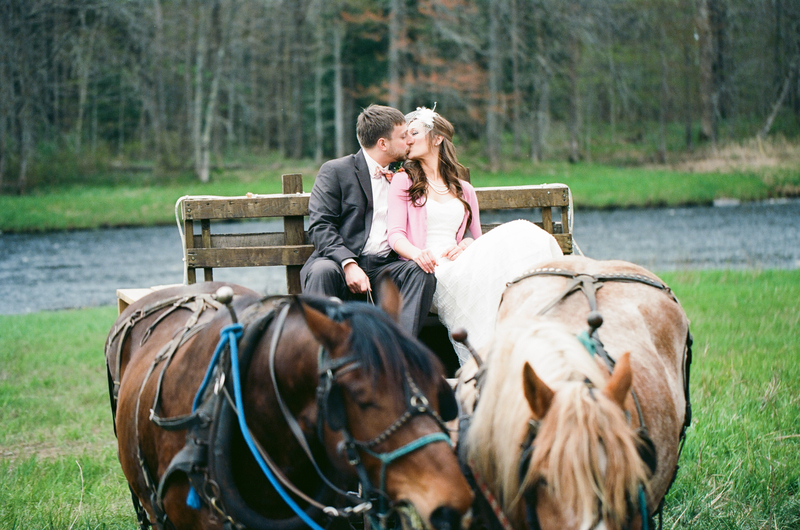 we hired a local man to transport our guests via horse/wagon to the ceremony site. one of nate’s wedding highlights was riding the steed. my stud on a steed. we also hired a local woman to put the finishing touches on the food. frost the beet & carrot cakes (which we froze after baking), put the salads together, drop the pasta in water, serve and clean up. my mom’s number one request when we told her we wanted a backyard wedding was that she didn’t want to do dishes. so we were very thankful to nancy and her two helpers. i had the amazing brooke fleetwood come from hudson, wi to do my hair and makeup. she works wonders. and, along with jessica sands photography and krystal muellenberg photography, 10 days before the wedding we hired sky blue weddings to do the amazing videography. they are fantastic! 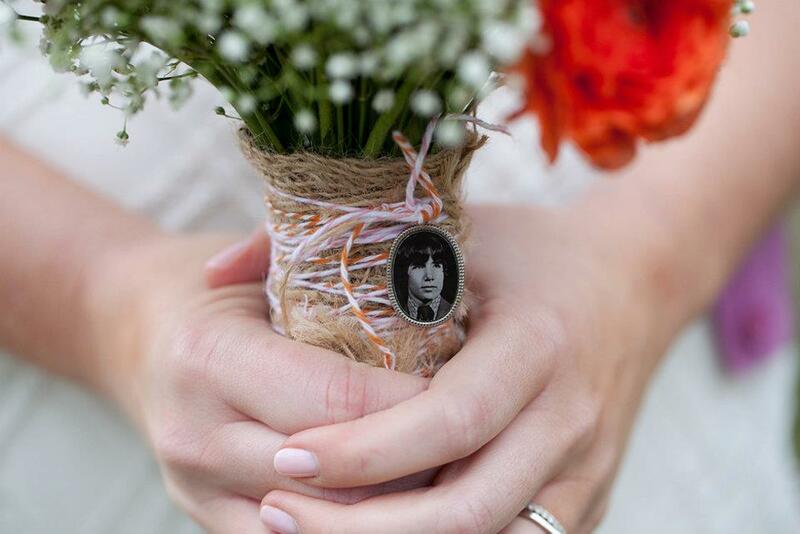 how did you incorporate your father into the wedding? i can honestly say i felt my father all day. the night before the wedding, i slept in bed with my mom, and we talked about how much he would have loved our wedding. our ceremony site was held in his favorite fishing spot on the jump river. our reception was in the woods right next to our house where i played as a child (our “sweetheart” table was where my dad kept corn to feed the deer!). i had a locket on my bouquet that my dad gave my mom as a gift when he was a senior in high school, before he graduated. 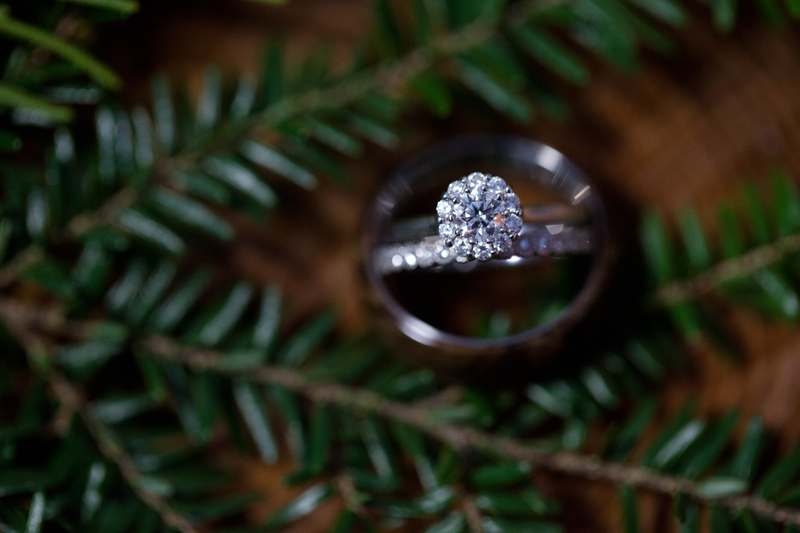 my wedding ring was a gift that he gave me a few weeks before he passed away, and he had inscribed “no wooden nickels” on the inside, reminding me to be discerning when choosing my husband. we didn’t think about this until after the wedding, but nate’s ring is made of wood. in the next “what the heck is a surprise wedding?” post, i’ll share a little about after the wedding, the responses, and the beautiful love we received. have questions about our surprise wedding? leave a message here, or e-mail me at sheena.sieg@gmail.com! ← we can’t stop listening to…. u looked beautiful in ur pics. I give u guys 2 thumbs up 4 doing what u did. Ur in love and thats all that matters. U and nate are going 2 make wonderful parents. Congradulations on both ur marriage and ur soon 2 b bundle of joy. Best wishes 2 u and nate and a life filled with happiness.